Yes, February is a bit late for me to be posting Christmas photos. But I have a pile of links to share with you that I’ve been collecting since last October or so, and I never did share any Christmas photos with you at all. I’m a typical agnostic cultural Jew in Brooklyn, raised by a conservative Jewish family. Pesach is my favorite holiday of the year, because I love the seders. But now that I’m with Dave, I’ve had to broaden my horizons a bit. Now, when winter comes, we have Channukah with my family, another Channukah with his mother, and Christmas with his father. This winter, we invited my 4 year old goddaughter and her mother to join us for Christmas, which I must say is the best idea we’ve had in ages. 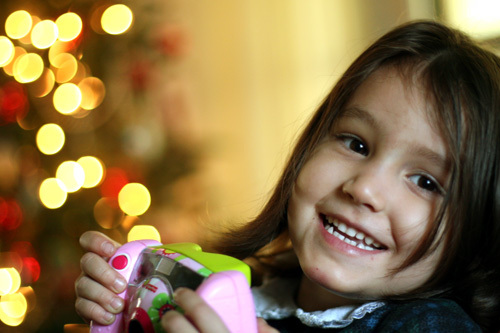 I spent a lot of time taking photos of her, which made it extra funny when it turned out that her mama Santa had left a Fisher Price digital camera under the tree for her. That’s her in the photo, of course. Isn’t she beautiful? I don’t see her nearly often enough, but I look forward to it and love her to bits whenever I can. I should be able to see her this month, and I can’t wait! And I think Dave enjoys having her around even more than I do. They play games like Duck Tag (which is what you call it when you play tag on the way to the duck pond) and he teaches her how to type. It is cute beyond words. Anyways, enough about my favorite small girl in all the world. Onto the links to tasty food blog posts! Dorie Greenspan’s Slippery-Slidey Cinnamon-Espresso Cup Custard sounds like a mouthful in the best possible way. Pumpkin Praline Tartelettes with Butter Pecan Ice Cream. Banana Bread Ice Cream from katesmash is high on my to-try list. Deb from Smitten Kitchen always has a few interesting ideas up her sleeves. Most recently, I’ve bookmarked her Butternut Squash and Caramelized Onion Galette, Chocolate Chip Sour Cream Cake (cubes of colossal cheer! ), and Black Bean Pumpkin Soup. Aki and Alex rarely post recipes, but when they do I am always interested. Here is their White Chocolate and Yogurt Ice Cream. Who could say no to Chai Oatmeal Cookies? Pim made gorgeous jars of Tomato Confit: oven-dried tomato in olive oil. Not to mention her quince caramels! My quince-obsessed partner would probably also love Mercedes’s Quince Ice Cream with Almond Praline. I am completely inspired by Khymos’s edible cocktails with gelatin – they are gorgeous! Have you ever wondered how to make those little chocolate bottles filled with liquor? Chadzilla explains how yo make vodka pills, the basic building block for creating liquor-filled chocolates of your own. For a tasty snack, I’d like to try the Carrot and Rosemary Miniature Scones from Chocolate & Zucchini. These simple Whole Wheat Squash Ravioli With Sage Butter from Cookthink just fill me with quiet glee, as do their radishes with prosciutto. From Obachan’s Kitchen, I found Ichigo Daifuku – Japanese sweets made of strawberry and sweet bean paste in rice cake. They remind me of the sakura mochi I eat at the Cherry Blossom Festival every year. Bea can make even a simple egg look luscious and refined, in her Eggs en cocotte with salmon, leek and its mouillettes. And for a sweeter of eggs, she also made these wintry gorgeous Vanilla Cardamom Snow Eggs, which are her favorite treat. I only discovered walnut liquor very recently, at a tasting near Union Square. Right afterwards, of course, I stumbled across this Vin de Noix recipe at Lucy’s Kitchen Notebook. I am awfully tempted to gather unripe black walnuts in Prospect Park next summer to create a batch of this! Evil Jungle Prince made Chinese shrimp dumplings even more delicious by browning them in a pan, making pan fried har gow. From Elise at Simply Recipes, I’d love to try her Kiwi Salsa and her Brandied Cranberry, White Chocolate Chip Cookies. Here’s a wonderfully creative (and garlicky) idea – Roasted Beets with Celery Root Skordalia! I am in love with Kuidaore’s Vacherin Mont Blanc – a sublime tower of delicate meringue layered with vanilla and rum flavored chestnut puree, it looks like something that should be served in one of the grand old dessert cafes in Hungary. Speaking of desserts that would make my mother’s palate rejoice, Fanny from Foodbeam made a to-die-for Mousse aux châtaignes (chestnut mousse). I am completely intrigued by Kitchen Wench’s Ho-dduk (Korean yeast-risen pancakes with sweet nut filling). They look like a great winter snack, and mostly I want to eat them while walking to the train in the morning on my way into the office. David Lebovitz’s ice cream needs no introduction. How about his Chocolate and Banana Ice Cream, which he says is the easiest recipe of them all? Lucullian Delights always has the freshest, prettiest photos. In particular, the Braised Leeks with Hazelnuts and Balsamic Vinegar caught my eye as something I’d love to make. As I was saying, I grew up in a typically Ashkenazi Brooklyn Jewish family, but I’d love to make Barbara’s Sephardic Matzo Ball Soup for my parents and brothers to see how it holds up. Nothing beats Mom’s chicken soup, of course, but there’s no harm in adding to our repertoire. I also am dying to try her highly caffeinated BuzzBarz! From the Passionate Cook, another recipe to tantalize my leek obsession, Leek, Gruyère & Hazelnut Quiche. I bought My Bombay Kitchen after seeing this recipe for One Hundred Almond Curry up at the Traveler’s Lunchbox, and I love it dearly after trying out a few more of the Parsi recipes contained therein. And from Milk and Cookies, the most beautiful grapefruit creation of the year for me, Grapefruit Soufflé. This Apricot Chestnut Tarte Tatin from Figs, Bay, & Wine combines some of my absolute favorite flavors in a way that never occurred to me – I can’t wait for apricots to come back into season so I can make it myself! Vanessa made Winter Sage Pesto with sage and spinach, which I really enjoyed when I played around with her recipe at home. I always get excited when I come across Hungarian recipes, like this Raspberry Hungarian Pastry I found on The Kitchn. I’m not sure I can think of anything more delicious sounding than these Bacon Chocolate Chip Cookies with Maple Cinnamon Glaze. And speaking of Hungarians, I am so pleased to have found Toadberry, a blog full of Hungarian treats, among other things. It caught my eye first with the recipe for Gerbeaud Slice, a signature pastry from Gerbeaud Cafe in Budapest. I remember sitting in Gerbeaud Cafe late one night with Dave a few summers ago, drinking hot chocolate and ice wine and eating wonderful desserts. Seeing this recipe brings back that memory for me, and I look forward to trying it out. What a great photo! She’s adorable. Thanks for the links … I think! (Like I don’t spend enough time already looking at food blogs.